I am extremely thrilled to announce that my first cookbook “Easy Chinese Recipes” is now available WORLDWIDE (scroll down to see where you can buy a copy of my cookbook) and on Amazon. It’s been a long journey from the moment I signed the book deal, two years ago precisely. It was a lot of hard work and dedication as I cooked, styled, photographed, and wrote the entire cookbook while I was pregnant. Check out the above promo video to learn more about the cookbook. The book is a compilation of 80+ easy Chinese recipes: popular Chinese take-outs in the United States, classic Chinatown dishes, restaurant-style recipes, and family favorites. Every recipe is graced with a color photo and many of them have step-by-step picture guide. Most importantly, all recipes are super easy, authentic, and deliver amazingly delicious results. Easy Chinese Recipes is a cookbook that you want to have in your kitchen—it’s filled with everyday recipes that you can refer to on a daily basis. Below is the book stores that sell “Easy Chinese Recipes.” If you are in the US, you can BUY NOW ON AMAZON. If your country is not on the list, please leave me a comment and I will get the answer for you. If you are a fan of Rasa Malaysia or a recipe tester, please spread the news to your friends and family as I strongly believe in good word-of-mouth. If you use social media, feel free to share it on your Facebook and Twitter. Last but not least, do remember to pick up a copy of the cookbook when it’s out. Thank you so very much for your continued support! Book Depository – FREE worldwide shipping! Kinokuniya (KL), MPH, Popular, Borders, Times. Kinokuniya, Times Newslink, Hudson News, Times, Harris Book Company, Prologue, MPH, and Popular. Shanghai Book Traders, Shanghai Garden Books, Shanghai City of Books, Shanghai Foreign Languages Bookstore, Beijing Foreign Languages Bookstore, Airport Media. Looks beautiful! Looking forward to having my own copy. Congratulations once again and best of luck! CANNOT WAIT! I feel so lucky to have been a recipe tester and thus had a sneak “taste” at the awesome recipes in this book! If the rest of the recipes are even half as good as the 2 I got to test, then the book is killer!!! And knowing you, there’s no doubt that is the case!! CONGRATS! Woo hoo! Can’t wait to see the finished product of your labor of love! If the recipes inside are like the cover, it’s going to be a winner. Many people don’t see Chinese recipes as easy and I’m glad you’re showing that it’s really easier than most others. This is a great cookbook cover. I love it. Congratulations Bee! Book cover looks AMAZING. You did it. Can’t wait to see the book. Everything looks so delicious… yum. What a huge accomplishment to be published.. Congratulations!! I’m sooo thrilled that it’s almost out. Can’t wait to see it and get a copy. Are you going to be doing book signings? Many congrats Bee! I’m looking very forward to adding your cookbook to my bookshelf! Oh Wow Bee….that cover looks amazing! Congratulations- you must be so proud! I don’t see a Middle East release date there but it’s ok. I’ll get it when I’m in UK over summer. Well done! Yay! It’s being released earlier in Malaysia! Will definitely look out for it! Congrats Bee! Can’t wait to get my hands on my own copy! Many congratulations Bee! Very excited for you. I’m sure it will be a huge success:) Kudos! BEE! Congratulations my girl. SO so proud of you and your hard work shows. The cover looks gorgeous! Wish we could buy in Middle East too but I sure can order it from US :-) Looking forward to it! Congrats!! Can’t wait to see the book! Congratulations!!! You are so amazing. I can’t wait for your cookbook to be released in Canada. I think you have a great blog and I am sure your cookbook is going to be a great hit! Congratulations and All the Best! The recipes I tested were awesome! Can’t wait for the book to hit India. Congratulations on getting it done. This is truly exciting, Bee. Though now that I have looked at this a bit closer, I realise it features Chinese recipes. 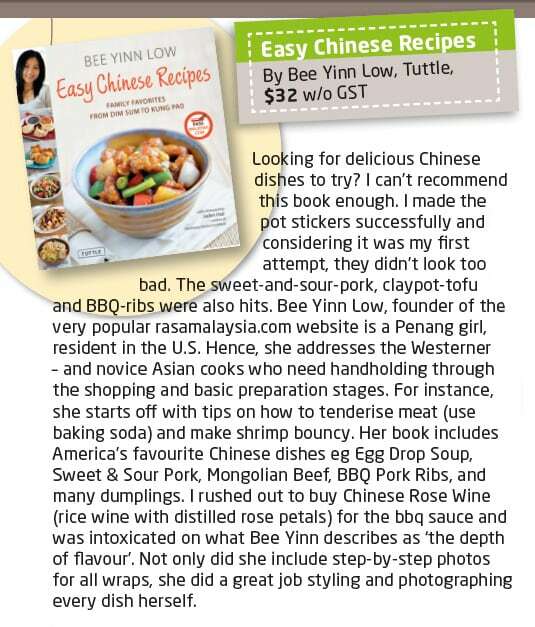 I was half expecting a Nyonya Recipe feature :) That would be the next project! Looking forward to see this on the shelf. Yep. 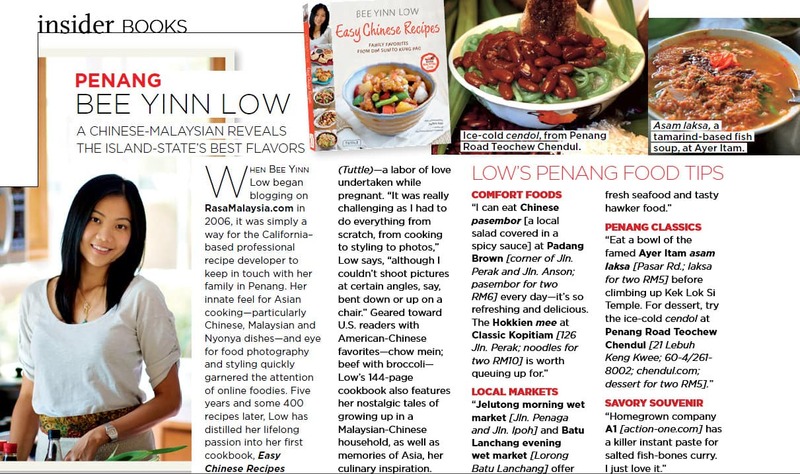 I hope to work on a Malaysian + Nyonya cookbook next. Boo hoo !! Australia is the last to get your new book! I can’t wait to have it in my hands! Congratulations! Will figure it out in book shop in June! Congratulations! I have been looking into your site since my younger bro introduced it to me. We both work overseas and obviously missed Msian food. Eventhough I am not much of a cooking person, I find comfort in looking into your blog and when I have the courage and strength to cook some dishes. Many thanks for sharing your recipes and I look forward to purchasing your book. So thrilled to see that Singapore will get to see the book first! Hi, I am in Finland now. Have been trying out ur recipes quietly. Would love to buy a copy of your book. Any idea how? Hi Gillian, will find out the release date in Europe and let you know. Congrats, Bee! The cover looks great. Can’t wait to see it on the shelves! Not being released in England ? Of course yes. Will find out the release date in the UK and let you know. Congrats on the book. Been following your blog for a long time, very happy on your continued success. Congratulations!!! I can’t wait for a look at the book!! I will be pre ordering ASAP, although I am in Australia so it will be November before I see it. If you need a tester in the future let me know I would love to be a part of your next venture. Congrats! It is on my birthday wishlist! question for You tho…We are trying hunt down site’s/blogs with any and all everyday authentic asian eating habits,recipes & customs. We adore yours but are looking for some more everyday style foods,menus ect..is there any you can recommend or know of? Thanks Niccii. I am sorry but don’t know about the everyday-style Asian food blog. Congrats! It’s on my “to buy” list! The book looks great! Just preordered mine and can’t wait to see it. Any chance this will be available in Europe? $16.47, will this price change later? congrats for your new book, can’t wait to read it. Yay! Finally, congrats! can’t wait to check it out. Hi Joey, I have spoken to the publisher about an Asian book tour. Will keep you posted. Hooray! I do hope they send you this way :) Meanwhile, I’ve already checked with my favorite bookstore here and they’ve already placed and order…yay! Hey Joey, thanks for your warm support. I am so glad that the book store will be carrying my cookbook! Tried to leave you a comment but Blogger is down. XO. Congrats on the cookbook. I cannot wait to get mine! Wow, congratulations! I’m sure this will be a big hit. I hope to pre-order mine as soon as I get my next paycheck. Bee, I’m getting the cookbook in the mail today!! So excited! YAYYY!!! I just got your cookbook in the mail today! Really looking forward to getting a copy of your cookbook!! Now we can get your cookbook in GERMANY, too (ordered it by http://www.bol.de). Our son, his wife and daughter are living in Singapore and have no long way to Chinese food. Good for them! With your recipes we also will be able to have a short way by cooking mouth-watering EASY CHINESE RECIPES in our own kitchen, now. Marvellous chance for us! GOOD TO HAVE YOU and Rasa Malaysia ….. THANKS! I made the Garlic Chicken and Shrimp fried rice today. They were wonderful! I love your cookbook. I am a big fan of you. I love your blog style and your attitude towards cooking. Very inspiring. Do you know where can I get a copy of your cookbook in Tokyo? Thanks. Just purchased your cookbook and it’s fabulous. Noticed that ‘beef with broccoli’ has missing instruction. Is that deliberate? I just purchased your book & can’t wait to start cooking. I, too, seem to be missing the instructions for the Beef with Broccoli recipe. I have the ingredient list, a big picture of the final product, but no instructions on what to do with the ingredients. There are no instructions on the right hand side of the page. I’m wondering if some of the books are in error? The recipe is to the left, it’s not missing. I purchased your book and read through it. Even thought I’m familiar with some of the “basics” in chinese cuisine I must say I’m impressed with the diversity of your recipes. I will walk into the best asian grocery shop in oslo on friday and catch some of the ingredients. If I am unable to find Maltose, is there any good substitutes? After some years of laziness I have finally got myself to do something about the future blog. Don’t be surprised if it pops up a review with actual testing of some of the recipes. I have been reading some more into your book and absorbed some of the information somewhat closer. It seems like some of the recipes presented in the book is “sauceless”. Was this intentional? It appears to be a lot of marinade ingredients presented in that recipe. I trust that you appreciate and respect constructive criticism. Btw. I have tried making the bbq Sauce, the outcome was delicious. After some asian grocery store hopping I couldn’t quite find maltose. What I did here was to roughly double the amount of high quality honey i bought in the store. The pork tenderloin is now marinating. I just used the regular shao xing wine which worked fine. gonna cook the char siu on sunday with the chinese cucumber salad and Jasmine rice:). Surprise for my better half. *correction: It appears to be a lot of marinade ingredients presented in for example the “mongolian” beef. Just checking in with a few words. I so far made your version of beef and broccoli, it turned out very delicious. I have to say that its pretty close to the one my former shanghai born father in law made + the one i used to eat in china town. But the version i cooked before and ate before was made with Chinese broccoli instead of regular broccoli. Please give us all some great dishes to prepare for Chinese New Year! I love your work btw, I have been a big fan since you first started. Can’t wait to get my hands on your book. Best of luck! I picked up a copy of this from work (I work in a museum gift shop) and WOW. I have made just about all of the chicken, beef and pork recipes and they have turned out so well! It’s so refreshing to be able to cook Chinese food without having to hunt high and low for the ingredients. I LOVE your sweet and sour sauce, I make it weekly and have used it often in just about everything else I cook. Hi,I really like your book and i have try cook follow your recipes,it’s easy to follow,healthy food and simply,but sometime i can not follow.Before this i have search your recipes from web and i will print it out,now i have your book.To get your new recipes i will search on rasamalaysia.com every day. I am not sure but I heard airport book shops have it. Dear Bee, First let me thank you for the recipes that you have been churning out. They are so clearly spelt out and easy to follow especially for a beginner like me. I recently took a great interest in cooking after my wife passed on. I have been regularly looking out for your recipe to cook meal for my 3 sons. I have also observed so many giveaways from your rasamalaysia.com but only to the US residence. I am from Malaysia following our very own recipes but can drool at the various giveaways. Can’t the offer be also extended to Malaysia? Would love to lay my hands on one of the giveaways. There are Malaysian giveaways….please stay tuned. 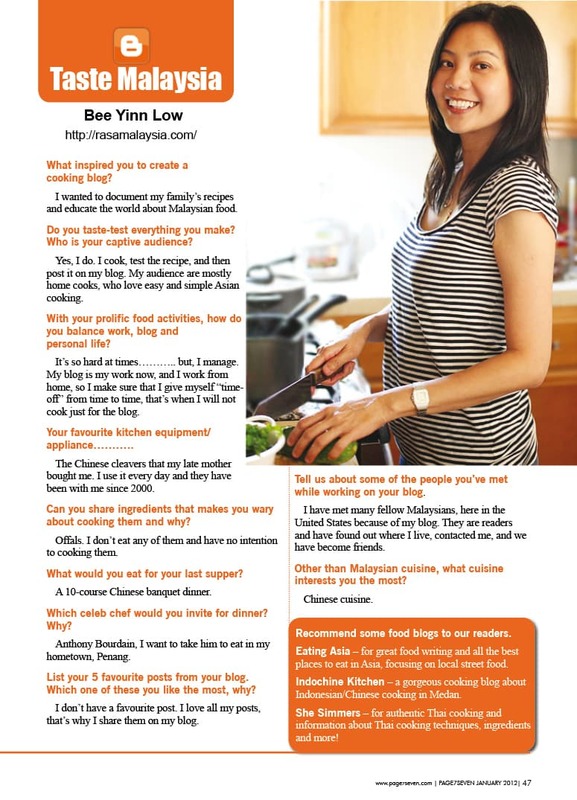 Hi Bee, I came across and bought your first cookbook in 2011 before I even got to know your blog (and follow you). I must say your receipes have since been pleasing the taste buds of my family and friends very much! I do have a question though, regarding your mango pudding receipe in the book; I’ve followed the method closely but after 5hours in the fridge, the pudding is still not set. Any suggestion why is this happening, and if you have any good advise to salvage them? I have a question regarding the receipe for mango pudding in this cookbook – I tried to make them today and followed the receipe closely but the pudding just wouldn’t set after 5hrs in the fridge. Any suggestion what causes this and if you have any advise to salvage them? Hi Jaclyn, if it wasn’t set, that means you didn’t use enough gelatin. Use more.